I’ve received several emails about Dinar Recaps over the past year, asking if I know who is behind it and what I think about them. Well I think my opinion should be obvious. I don’t think much of any site that appears to be promoting a pipe dream like “The RV”. That would include Dinar Recaps. As I posted in August, their daily revenues are estimated at $225 by Website Outlook, and that’s 365 days a year. Other web analysis sites put the figures even higher. Not bad for a strictly rumour/intel site, huh? It would also include Dinar Guru which was actually created two months before Dinar Recaps, although the tone there is much more guarded IMO. Before I share my research I think it’s important to note that before either one of these sites came along there was a site called Dinar Rumor, which was created and run by SFMedic from the sites Dinar Veterans and Dinar Speculator. It was pretty popular for awhile, but after a year or so it lost its sizzle as the other forums absorbed a lot of the rumours into their sites. Apparently Medic’s strengths were on the intel/analysis side and not on the marketing side. Thus the opportunity for new sites like Dinar Recaps and Dinar Guru that know how to employ modern internet marketing techniques. 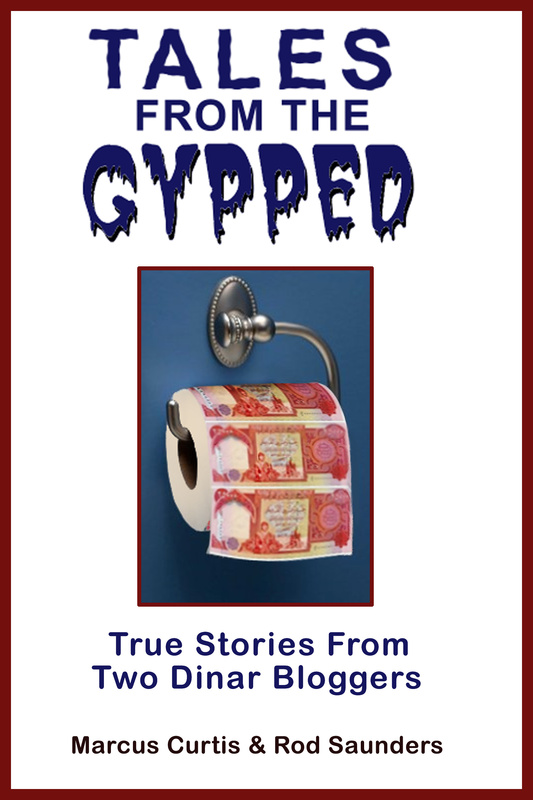 Let’s start with the more popular of the two which is Dinar Recaps. One of the biggest complaints that I hear about them is that these idiot gurus who never get anything right and obviously are lying through their missing teeth are never challenged about the feces that they fling. That’s because it’s against the rules at DR.
As we have observed over the years, dinar sites that don’t encourage or even allow open discussion of the dinar “investment” seem to always have an agenda. I’ve made it a policy since I started the blog to build my case about the dinar and the douchebags pumping it with links. That way I’m only dealing with information that is already public. I don’t pay for information and I rarely repeat information given to me if I can’t link to it. Unfortunately I don’t have any links identifying the owners of Dinar Recaps. But I can provide a few very informative links. First of all, SweetQueen tells us that the owner goes by the name of Dinarstars. Next we find a reference to a partner named Big Bird on their About Us page. Right below the address it says DRT Distribution. If you’ll go to https://www.njportal.com/DOR/businessrecords/EntityDocs/BusinessList.aspx I would assume you’ll be able to find the information you’re looking for. As for Dinar Guru, the details are a tad less accessible. The owner’s name is supposedly Blanche Bonet, and she states her home town as New Orleans. It’s not surprising that I was unable to locate a person by that name living in Louisiana or anywhere else in the US. I would assume that it’s an alias, of course. So I looked around and found this. Here the address is listed as 4640 S. Carrollton Ave 200-199, New Orleans, LA 70119, USA. When I did a search on that address it brought up DavinciVirtual.com. They provide virtual offices to “mpress your clients with a virtual address”. That’s a shocker, huh? So now where do we go? Well, let’s check the domain name in WHOIS. 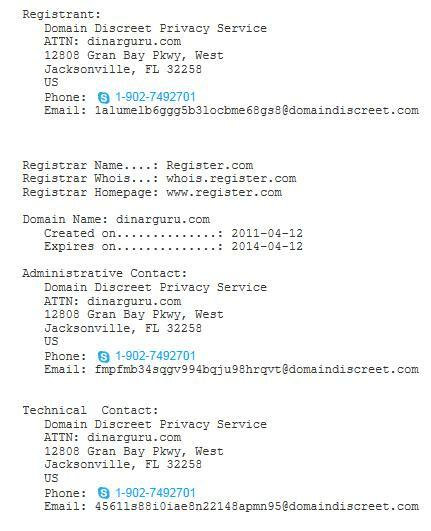 Nope, the registrant is private and it’s handled by a company in Jacksonville, Florida. Hmmm …. now what? Well, when you order a membership at Dinar Guru the name NOLA Group comes up on the Paypal page. So I looked up “NOLA Group” in Google and found an internet marketing company in Toronto and a software developer in Garland, Texas. (I looked around and found a “nola girl” and a “nolaspice” mentioned at Dinar Recaps. Interesting, huh?) So we have a name that is probably fake, with a private domain name provided by a company in Jacksonville, a virtual address in New Orleans, and a marketing company in Toronto or a software guy in the Dallas area. My conclusion? This person (or persons) is a pro. They have covered their tracks well. I could be way off here, but I think “Blanche” is a persona created by a professional internet marketer(s). It’s interesting to see that Dinar Recaps is located in the source code for Dinar Guru under “keywords”, and vice versa. Maybe they just did this to draw traffic when people type the other site’s name into Google, but there’s something else to consider. The disclaimers on these two sites are almost identical. 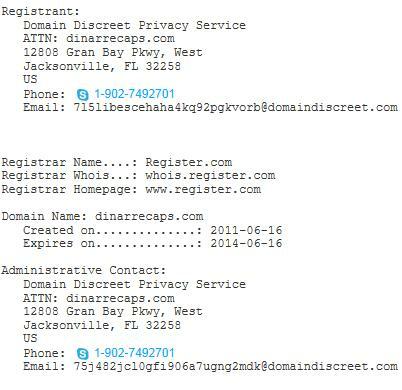 And it turns out that both sites use Domain Discreet Privacy Service in Jacksonville, Fla. according to my WhoIs search. Out of curiosity I went to the Domain Discreet website and found nothing but a parked domain page. Interesting, huh? Why would a company in the domain name privacy business not have a professional looking website? Unless perhaps they aren’t soliciting business. Why wouldn’t they want to solicit new business? Well maybe they only exist for a specific purpose, like providing domain name privacy for their own websites. Just a theory. If you type the Domain Discreet address of 12808 Gran Bay Pkwy W, Jacksonville, FL into Google you will find a match with a company called web.com. Ahhh … the plot thickens. According to Wikipedia web.com provides websites, website design, website hosting, internet marketing, lead generation, and eCommerce. It’s entirely possible that web.com and domaindiscreet.com have nothing to do with the dinar, and that Dinar Recaps started up a couple of months after Dinar Guru and just copycatted the disclaimer, keyword technique, and privacy service. But it does seem very coincidental to me. Blanche tells her readers about how she came up with a way to keep track of the latest guru postings. I think what “Blanche” is doing is utilizing a tool called RSS which stand for “rich site summary”. It’s a way of automating content from blogs and news sites with a script that feeds it into your site. Your average housewife dinarian wouldn’t know jack about this. 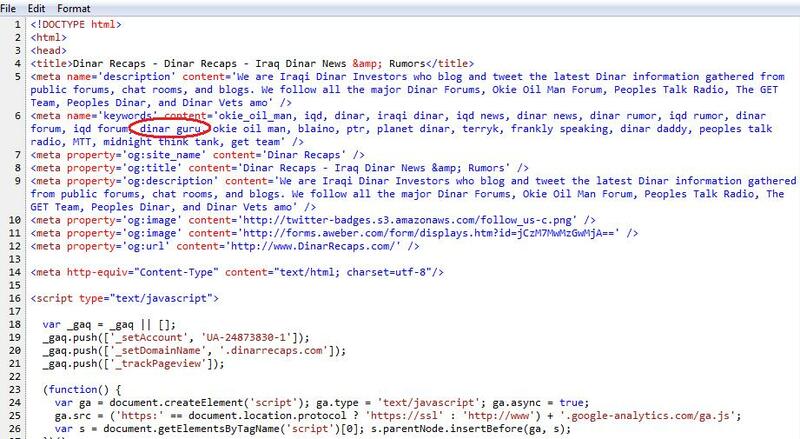 If you look through the source code at Dinar Recaps you’ll see that they use RSS. I don’t see RSS at Dinar Guru, although you will see it used on their sister site DongGuru. There are plenty of alternatives to RSS that “Blanche” might be using but again, this isn’t something your average dinar guru follower is going to know about. It looks like she edits the content to suit her site, which opens up many possibilities. Looking through the Dinar Guru site you will see that it is well monetized. There are ads for luxury cars, luxury SUVs, forex charts, currency conversion, web hosting …. all resolving to a location on a site (keywordblocks.com) hosted by media.net with locations in Austin and Dubai. Pretty sophisticated for an “Iraqi Dinar Guru expert who loves her grandchildren and family” as she states on her Twitter page. Dinar Recaps has a Twitter page as well, and it’s very similar to Dinar Guru’s. They each have a Facebook page also, although Dinar Guru’s seems to receive more attention. Also quite interesting is this thread at Dinar Vets. It seems that both sites went down and came back up at the same time earlier this year. Despite the similarities there are distinct differences in the two sites. Dinar Recaps allows comments, albeit censored comments only. Dinar Guru has no comment feature. Dinar Guru has a link to a dinar dealer called GID Associates. I found no such link to a dinar dealer at Dinar Recaps. And Dinar Recaps seems to cater to the religious crowd where “Blanche” tends to avoid that emphasis. My sense is that both of these sites started up shortly after Med lost interest in his Dinar Rumor site because they saw the potential for web traffic if the concept was used properly with modern search engine optimization, marketing, and automation techniques. I can’t say conclusively that the two are connected in any way, but I am very curious about the similarities. As we have seen time and time again, this dinar “investment” is driven more by internet marketing than it is by sound investing principles. I’ll keep looking into this.